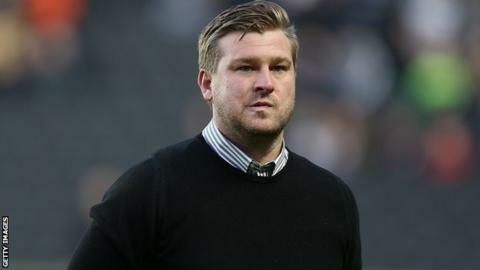 MK Dons boss Karl Robinson has turned down an offer to manage Leeds United, reports BBC Three Counties. Robinson oversaw the Dons' promotion to the Championship in 2014-15 and their subsequent relegation this season. The 35-year-old met with Leeds chairman Massimo Cellino in London on Friday about the managerial position. Leeds' current head coach Steve Evans, who is on a rolling contract, has been unsure of his future since the end of the campaign. MK Dons chairman Pete Winkelman said he could not guarantee that Robinson would be in charge next season after they finished 23rd in the Championship. Evans, who took over at Elland Road in October 2015, has said he would like to stay on at the club but he still does not know his future. Leeds, Cellino and Ross McCormack's licensed agent Derek Day are currently responding to a charge by the Football Association that they breached football agent regulations during the sale of McCormack in 2014.